Scion FR-S Pros and Cons | Page 1 of 1 | Why Not This Car? What drives people to buy (or not buy) a certain car? 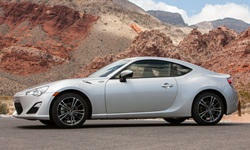 TrueDelta's members share Scion FR-S pros and cons based on their real-world driving experiences. So far so good! Its an excellent, economical sports car! This car, with a frugal driver, achieves mpg far in excess of EPA estimates. With the 6-speed manual, the FR-S is rated at 22/25/30 achieves 26 in congested suburban driving, 31 in mixed and 37+ on pure highway trips. I love the styling, though this is always subjective. I think the surface tension is great, the "shark" nose is interesting, and the vintage "T" graphic from Toyotas of the past is present in the grill mesh, dash trim, gauge trim, etc.